There is a lesson to be learned from Charles Guggenheim's Academy-Award-winning documentary eulogy, Robert Kennedy Remembered, shown to an invited audience on the final night of SilverDocs this past June. It is this: Let the viewers see the person. Give us the visual evidence and let us make up our own minds. That's what Guggenheim did brilliantly in this film and in a series of political spots shown before it. The notion of a 40th anniversary showing at SilverDocs started when a clip from the film was shown to young South African filmmakers during a cultural exchange visit that festival director Patricia Finneran made with Guggenheim's daughter, Grace Guggenheim, president of Guggenheim Productions, Inc. "Despite its rather slow and elegant pace, this decades-old film reached out across culture, continents and time," Finneran said. At SilverDocs it became the end piece in a series of retrospectives under the heading 1968 and Beyond.Charles Guggenheim (1924-2002), often called the father of the political documentary, made over 100 documentary films and won four Academy Awards. SilverDocs commemorates his life and work with its annual Guggenheim Symposium, which this year honored director, producer, writer and actor Spike Lee. Robert F. Kennedy, brother of assassinated President John F. Kennedy, served as Attorney General in his brother's administration, was elected Senator from the State of New York in 1964, and ran for President in 1968. He defeated Senator Eugene McCarthy on June 4 in the California Primary. He was assassinated after speaking to supporters in the ballroom of the Ambassador Hotel in Los Angeles in the early hours of June 5. As he took a shortcut through the hotel kitchen, he was fatally shot by Sirhan Sirhan, a 24-year-old Palestinian American. Kennedy died in the hospital the following day. The Kennedy family asked Guggenheim to produce a memorial biography of Robert Kennedy that could be shown at the Democratic Convention in Chicago in August 1968. The film had to be completed in a matter of a few short weeks. According to Grace Guggenheim, the first release print barely made it to Chicago in time to be shown--if it was going to be shown at all. No one was sure until the last minute that the showing would be permitted. Charles Guggenheim was not simply a camera for hire. He was an advocacy documentarian, making films on topics he strongly believed in. According to Grace Guggenheim, he saw "making political documentaries as a natural evolution. If you do social action films, the next step is to support candidates that support the things you are advocating." His method of making a documentary for a political candidate was to have the candidate challenged in natural settings--for example, with blue-collar workers, farmers or housewives, answering questions about issues that mattered to them. Guggenheim would capture the candidate's responses on film and use these to create the issues that would frame the biographical film. Then he would spin off these issues to make the campaign spots. It seems almost strange today to see a candidate just standing in front of a group and telling them what he believes. No pop-up graphics. No attacks on the opponent. No testimonials. Just: "Here I am and this is what I stand for." One spot shows Kennedy engaged in activities with his wife and kids. The narration says, "A man with ten children must do something about the future." 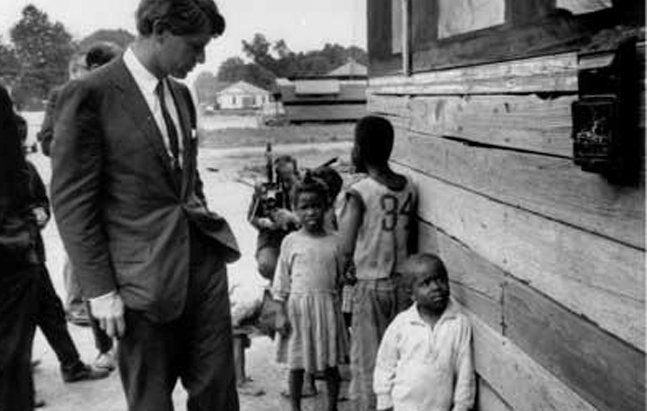 In another, talking with farmers, Kennedy says, "There are children starving right here in the United States." He says to the farmers that we need to work out a system where you produce the goods that can be made available to those who need them. A highpoint of Robert Kennedy Remembered is the speech he made in Indianapolis on the night Martin Luther King Jr. was assassinated. Speaking to a mostly black audience from the back of a flatbed truck, he told them that he understood their pain and their anger. (And who could question the credentials of the brother of an assassinated President?) He told them it was a time for grief but not a time for violence. And while America experienced violence and rioting and death in some 100 cities, Indianapolis remained calm. Speaking after the film, Frank Mankiewitz, who was Kennedy's speechwriter, said they had heard King had been shot as they were flying toward Indianapolis, and they knew that Kennedy would have to address it. They roughed out some ideas for a speech and Kennedy went back to his place on the plane to write it. In Indianapolis, Mankiewitz was separated from Kennedy, and the bus carrying him and the written speech was delayed until after Kennedy began his talk. So Kennedy's moving plea was "entirely extemporaneous." Charles Guggenheim stopped making political films when the emphasis changed from a documentary approach to selling the candidate as whatever some political consultant thought the public wanted him to be. The obituary posted on the website for Guggenheim Productions, Inc. (www.gpifilms.com/cegbio.html) states, "Guggenheim simply sought to reveal the character of his candidates in an affirmative way and let the issues speak for themselves. In a speech before Congress, Guggenheim explained why, in the early 1980s, he had quit the business of political advertising. He said, ‘If you play the piano in a house of ill repute, it doesn't make any difference how well you play the piano.'" When Robert Kennedy Remembered was shown at the 1968 Democratic Convention, the rights clearance was quite limited. In some cases, apparently, the clearance was for that one showing. Grace Guggenheim has spent the past five years getting clearances so the film could be shown. It aired on Maryland Public Television during SilverDocs, and that was its first broadcast in 40 years. The film is now available on DVD and VHS from the Robert F. Kennedy Memorial (www.rfkmemorial.org/shop/). It's worth noting that the discussion that followed the film was devoted almost exclusively to Robert Kennedy, his life, what he believed in and the promise that ended with his death. In other words, everyone was caught up in the subject of the film. No documentarian can ask for more praise than that. Barry Hampe is the author of Making Documentary Films and Videos, Second Edition (www.makingdocumentaryfilms.com) and is working on a new book about behavioral documentaries. E-mail: barry@barryhampe.com.